A revitalization of the entire Mazda Road to Indy will be completed this weekend when the brand-new Tatuus PM-18 makes its race debut in the Pro Mazda Grand Prix of St. Petersburg Presented by Allied Building Products. The PM-18, which for cost-benefit reasons uses the same basic chassis as the USF-17 that was introduced into USF2000 last year, completes the process which began in 2015 with the advent of the Dallara IL-15 in Indy Lights. The cars have proved to be fast in testing and the drivers have been reveling in the increased level of performance both in terms of horsepower and downforce. There seems to be little to choose between a talented group of Pro Mazda veterans and rookies, all of whom are excited about their prospects on the unforgiving streets. An impressive crop of rookie drivers will include rising American star Oliver Askew, 21, from Jupiter, Fla., who steps up to Pro Mazda after winning last year’s USF2000 title as a rookie for the locally based Cape Motorsports team, and personable Canadian Parker Thompson, 20, who is also graduating with the same team, Exclusive Autosport, with which he finished third in the 2017 USF2000 title-chase. A pair of teenagers, Rinus VeeKay from the Netherlands, who finished a close second in USF2000 last year, and New Yorker Robert Megennis, who won the St. Pete opener in 2017, also are moving up to Pro Mazda with Juncos Racing, which guided Brazilian Victor Franzoni to the 2017 Pro Mazda championship. Other rapid newcomers include David Malukas, from Chicago, who, after a promising maiden season of USF2000 in 2017 (which included a pole position at Road America), set the pace for BN Racing in a final pre-season test this past weekend at Barber Motorsports Park, and Harrison Scott, from Chelmsford, England, who, along with Italian-based RP Motorsport Racing and teammate Lodovico Laurini, will be racing for the first time in North America after dominating the 2017 Euroformula Open Championship. Los Angeles-based Russian Nikita Lastochkin will return to the Cape Motorsports team for his sophomore Pro Mazda campaign, while Kris Wright, from Pittsburgh, Pa., joins BN Racing. Additional rookies will include Brazilian Rafael Martins, formerly a race winner in British F4, and young Mexican Andres Gutierrez, both of whom will join Robb at Team Pelfrey plus English Formula Ford Festival winner James Raven (DEForce Racing) and the youngest driver in the field, 15-year-old Canadian Antonio Serravalle, who has joined Exclusive Autosport. A 30-minute practice session beginning at 8:10 a.m. EST on Friday will be the only opportunity for the Pro Mazda contingent to become familiar with their new cars on the track prior to the first of two qualifying periods at 1:15 p.m. Qualifying for Race Two will take place at 8:00 a.m. on Saturday, followed by Race One at 12:10 p.m. The green flag for Race Two is set for 4:30 p.m. on Sunday. Additional coverage of the Mazda Road to Indy can be found on a series of platforms including Road to Indy TV, the Road to Indy TV App and dedicated broadcast channels on demand via Apple TV, Amazon Fire and Roku and, most recently, the Xbox One Official App as well as live streaming and live timing on the series’ respective websites and indycar.com. Indy Lights is also featured on the Advance Auto Parts INDYCAR Radio Network broadcasts on Sirius 214, XM 209, IndyCar.com, indycarradio.com and on the INDYCAR Mobile app. 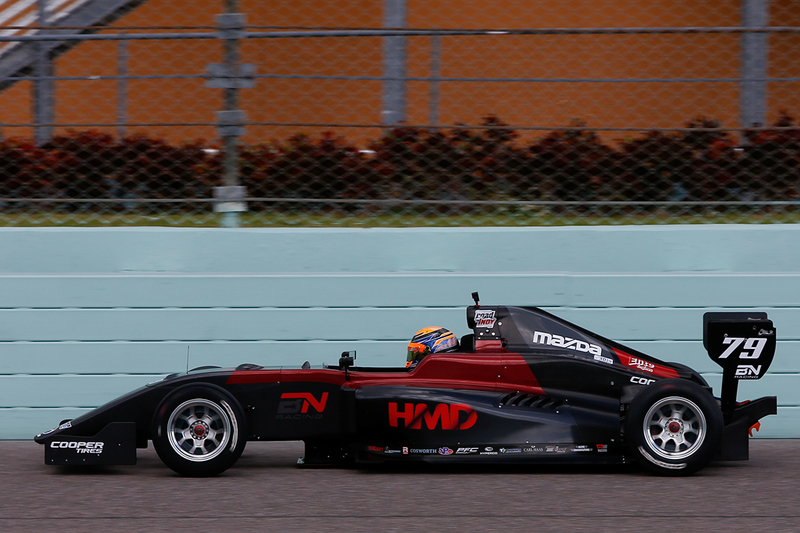 Images and content courtesy of the Mazda Road to Indy.